of the American Marketing Association. Roger S. Peterson is a Professional Certified Marketer (PCM™) of the American Marketing Association, one of only 196 persons in America to gain this status. 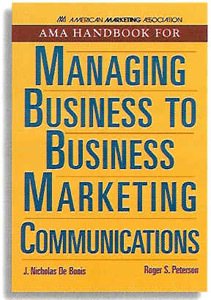 He is the co-author of the "AMA Handbook for Managing Business to Business Marketing Communications," the American Marketing Association’s official reference on the topic. Peterson has 30+ years experience in sales, product management, advertising and high-tech marketing communications (marcom) management. 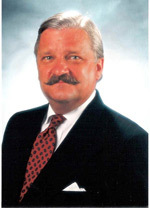 Unlike most marketers, Peterson had two successful sales careers and is a widely published business writer. His product development and management experience was as an acquisitions editor in the college textbook business where he developed and published 45 textbooks. He has published more than 100 articles and two books. He writes the "Legalese" column for COMSTOCK’S Magazine and is a former Contributing Editor/Columnist for TRADESHOW WEEK magazine. Publications list link. His advertising experience is from the recruitment advertising divisions of Ogilvy & Mather and J. Walter Thompson and a small B2B ad agency in San Mateo. Education: BA, Macalester College, St. Paul, Minnesota. Professional Certified Marketer, American Marketing Association. Is your marketing program keeping you awake at night? Your tradeshow program just isn't working? Sales and Marketing Departments working at cross-purposes? Too many review cycles on copy, graphics, ads or tradeshow exhibit designs? Too many people insisting on approvals? Disagreements about marketing direction -- no strategic focus? Your ad agency or PR firm just doesn't seem to get it? Customers don’t perceive your firm as you want it positioned?